Hanoi (VNA) – The 12th International Exhibition on Electrical Technology and Equipment (Vietnam ETE) and the 9th International Exhibition on Products, Technologies for Energy Saving and Green Power (Enertec Expo) will be held in Ho Chi Minh City on July 17-20. The two events feature nearly 600 booths set up by prestigious domestic and international brands, including Dien Quang, Gelex, Hitachi, Panasonic, Siemens, An Thai, Rang Dong, and JA Solar, among others. Particularly, the Korea Smart Electric and Energy Week held in the framework of the exhibitions will see hundreds of leading electrical enterprises from the Republic of Korea displaying their latest energy-saving products and technologies. A wide range of seminars have been scheduled to discuss issues in the green energy sectors. Meanwhile, business matching and on-site surveys will be organised in the framework of the exhibitions, creating cooperation opportunities for domestic and foreign firms. 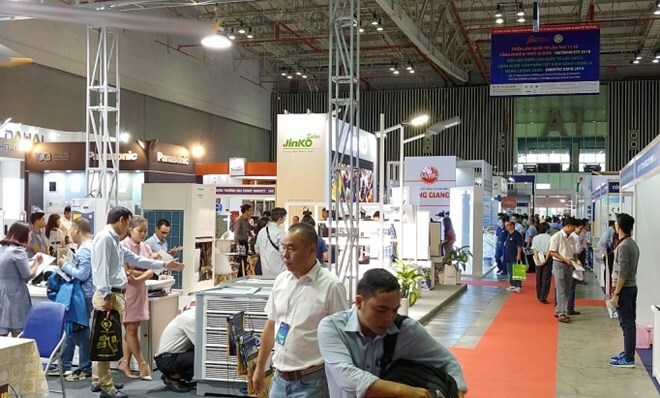 The Vietnam ETE and Enertec Expo, jointly held by the C.I.S Vietnam Advertising and Exhibition Joint Stock Company and HCM City Centre for Supporting Industries Development, are the largest annual exhibitions on electrical technology and equipment in Vietnam since 2007.